Zach Martin is a Grade 12 student-athlete at Vimy Lacrosse now in his third year at Vimy Ridge Academy. Zach’s development has been exemplary at Vimy Lacrosse. This past year Zach played for the St. Albert Miners Junior A team as a first year junior player. Making the cut as a first year player is an incredible achievement. Zach primarily played on the defensive side of the floor and dressed for 11 of the Miners’ games. Zach is very strong defender with great explosive speed. He utilizes these attributes as a box lacrosse defender and as a long pole in the field game. 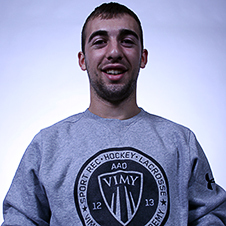 It has been a pleasure working with Zach at Vimy Lacrosse because he symbolizes what Vimy Lacrosse is all about. Zach’s academic record equals his efforts on the field. Zach currently carries an 89% average in his core classes. His work in the classroom reveals his great commitment to excellence. Zach is a role model for the younger Vimy Lacrosse students and proves that hard work does pay off. He has been that role model since the first day he started at Vimy Ridge and has made all of his instructors proud of his achievements.